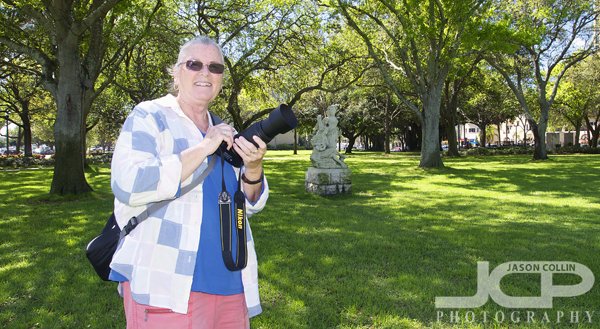 Diana with her Nikon D40 in North Straub Park during our 1-on-1 photography lesson in St. Petersburg FloridaOn a beautiful, sunny St. Petersburg morning I met Diana for a 1-on-1 DSLR Photography Lesson with her Nikon D40. She has had the DSLR for four years and before that film SLR cameras for many more years, but she had been only using the D40 in auto-mode. My lessons are specifically for getting getting people off auto-mode (the horror!) and taking control over their camera shooting in manual mode. A DSLR wants to be told what to do, and personally I would rather using a simple point-and-shoot camera in auto-mode than a DSLR. I began by teaching Diana my 5-step process for getting a well exposed and sharp shot in any lighting conditions and filling in her existing photography knowledge about aperture & shutter speed, etc. We practiced how to control depth of field and how to photograph moving subjects beore finishing with a little shade vs. direct sunlight portrait shots. With continued practice and keeping in mind what we covered during our 2-hour lesson this morning, Diana will be able to stay off auto-mode and produce more consistent results in manual mode.